We believe that wealth management is not only about where your money should go, but where it can take you. Nothing is more important to us than listening to, and really hearing, you. At Provo Financial, how well we help you pursue your goals is our most important measure. Before we recommend a path, we have to understand where you are and where you would like to go. To accomplish this, first,we listen. We ask questions. We share possibilities and discuss concerns. And we hear you. Together, we clearly define and verify your objectives. Only then do we draw upon our experience, and our alliance with Securities America, to develop a plan that is appropriate for your unique situation. The resulting strategy is yours alone. We provide custom strategies for each individual client, but all are built on the same foundation: a focus on proactive risk management, while drawing on our experience and comprehensive research to consider appropriate investment options. An inclusive look at liquidity concerns, risk tolerance, tax status, income needs, other investments, workplace benefits, trusts, estate needs, special needs planning, business continuity, as well as many other factors, helps us determine what the appropriate investment mix might be for each client and for each account. It begins with our solid investment principles and process. We never stray from you. Your goals are the bedrock of our investment process. We never proceed without fully understanding your objectives, and we always keep them in mind as we develop and manage your portfolio. We draw on our own research, the research of Securities America, and our relationships within the investment community to identify trends and opportunities within the market. We then adopt prudent allocation models based on asset classes we believe are appropriately suited to address your objectives. We align your assets with your objectives to determine and assign the appropriate risk profile for your unique situation. Starting with the universe of non-proprietary investment vehicles at our disposal, we design a portfolio and plan that addresses your goals and investment philosophy. We use portfolio analysis and review tools to help enhance investment allocation and timing strategies, helping you to capitalize on potential investment opportunities as they appear. The result is a strategy hand-crafted just for you. To be clear, no strategy ensures a profit or protects against a loss. There is no "right" time to enter or exit a market. There is no guarantee that the investment objective mentioned here will be met. We regularly monitor asset allocation to help optimize your portfolio’s performance and risk profile. With your objectives at the forefront, we manage your assets with partial, full, or non-discretion. You choose how much involvement you wish to have in the ongoing management of your assets through Securities America. Through it all, we provide you with full transparency. 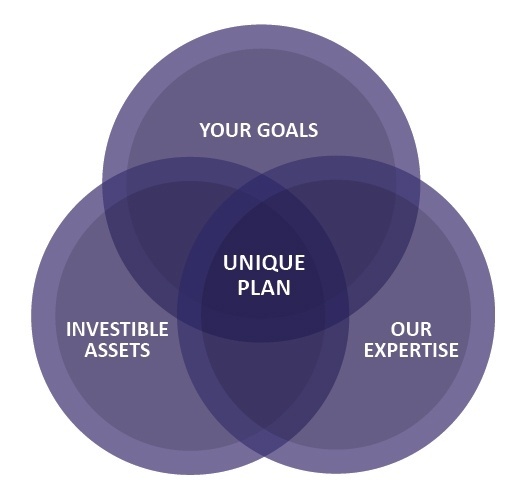 Our wealth management plans are designed specifically for each client and situation. All products and fees are transparent and explained in a way that is easy to understand, and we put the financial well-being of our clients above all else. That is the approach that has worked since 1993, and it's the one we continue to implement everyday.